Welcome to the twelfth day of 31 Days of Simple Organization! To read all the posts in order, visit the Overview Page. Confession: We were nearly out of food storage containers. I wondered who we’d given food to who hadn’t returned our containers. I also tried to figure out if I’d accidentally thrown some containers away… And then I cleaned out my fridge – ahem. A serving of broccoli here, a moldy piece of chicken there… oh, it was bad. And an overflowing sink-full of plastic containers later, I had an organized fridge and I’d solved the case of the missing containers! 1) If you’re not sure when something was made, toss it. 2) If you’re going to put it back in your fridge for another week, not eat it, and throw it out later, save yourself the hassle and throw it out now. 3) Use this opportunity to quickly wipe crumbs and other grossness out of your fridge. 5) Group like-items together. Beverages in one spot, veggies in another, left-overs in their own place, etc. 6) Pick any day of the week for your fridge clean-out day. Then clean out the fridge on that day every week. I used to do this and it cut way back on food waste, plus it only takes 5-10 minutes when it’s done weekly. I’m happy to be starting fresh with my fridge this week! Scroll down here for more kitchen tips. 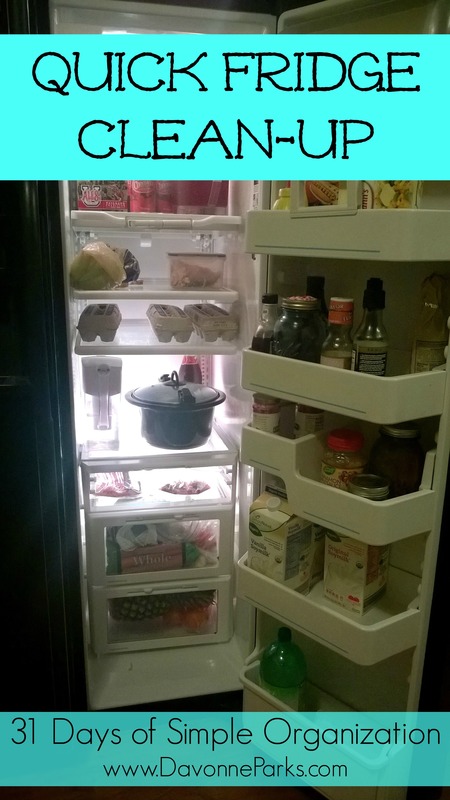 How often do you clean out your fridge?